One week down. The Huskers have completed seven practices in fall camp, and for the most part, things are going as planned for Scott Frost. There won’t be word on who the starting quarterback will be for about two weeks yet, and Frost will be looking for improvement out of that entire unit until then. When asked about true freshman Adrian Martinez in particular, Frost said much the same. Elsewhere on offense, the running back battle made a lot of news this week, particularly with sophomore Tre Bryant and true freshman Maurice Washington putting themselves squarely in the mix for playing time. Senior Devine Ozigbo is also progressing positively. Frost hadn’t gotten to see senior linebacker Luke Gifford in action until this past week. By all accounts, Gifford made a strong first impression. 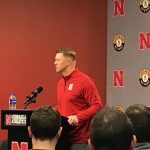 Frost stressed the importance of keeping his players active during the warm-up and stretch period of practice, saying that some players are even tired after warm-ups. Frost named Gifford, senior receiver Stanley Morgan, junior linebackers Mohamed Barry and Will Honas, senior linebacker Dedrick Young as players who are embodying the type of toughness and physicality the coaching staff wants to see. There’s still no update on freshman receiver Dominick Watt’s arrival. Frost remains optimistic, but can’t estimate exactly when he’ll arrive. Frost also updated the situation regarding sophomore linebacker Quayshon Alexander and senior linebacker Sedrick King. Alexander is out for the season with an undisclosed injury, while King is currently dealing with personal issues in his home state of Florida. Frost expects King to return to Lincoln soon, and make a decision on whether or not he wants to be a member of the team in 2018. You can contact Tommy at 402-875-3539 or you can follow him on Twitter @Tommy_KLIN.